Surrounded with lush greenery and bathed in natural sunlight, Plate is a vibrant and contemporary restaurant that offers some of the finest culinary creations. Showcasing a specially curated menu of Singaporean cuisine and classic European dishes, expect a relaxed dining experience that will satisfy the heartiest of appetites. A buffet breakfast is served every morning. Vegetarians, look away. Plate is raising the stakes with the ultimate protein pantheon – “Meat on Thursdays” is a unique dining concept that celebrates meat unabashedly. From Slow-roasted Fillet Mignon and Australian Grain-fed Rib-eye Steak to perfectly pink Rack of Lamb and sticky glazed Barbecued Pork Loin Ribs, the restaurant will transform into a carnivore’s paradise with these live carving stations every Thursday night. The meat-focused buffet dinner also features a free-flow spread of salads, meat-heavy appetisers, hearty soups and tempting desserts. Children between the ages of 7 to 12 years old dine at 50% off. Children 6 years old below dine for free. 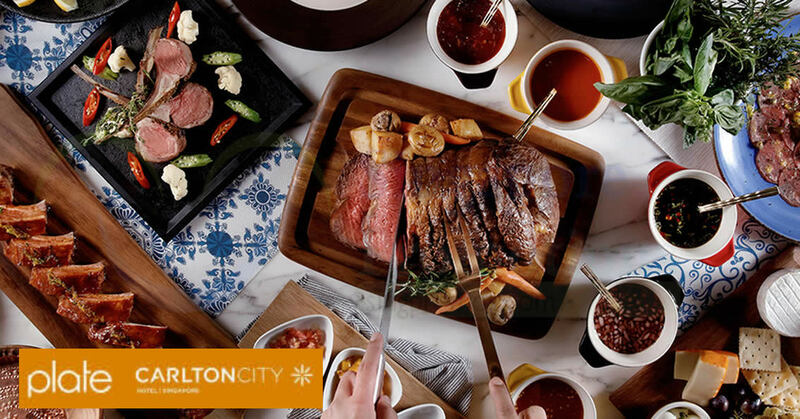 Enjoy 1-for-1 “Meat on Thursdays” Buffet Dinner at Plate, Carlton City Hotel with Citibank cards. Not a Citibank cardmember? Apply for a Citibank card for a limited time & get free sign-up gifts! Visit www.citibank.com.sg for more info. Meat on Thursdays Buffet Dinner is only available every Thursday from 6.30pm to 10.00pm. Prices indicated are subject to prevailing government taxes and 10% service charge. Promotion is valid from 1 January 2019 to 31 March 2019. Citibank’s and Plates’ decision on all matters relating to the Promotion will be determined at its reasonable discretion and is final and binding on all participants. Citibank shall not be responsible for the quality, merchantability or the fitness for any purpose or any other aspect of the products and/or services provided by third parties and Citibank shall not at any time be responsible or held liable for any loss, injury, damage or harm suffered by or in connection with the products and/or services provided by third parties. All disputes about quality or performance of the product and/or services shall be resolved directly with Plate. Citibank and Plate reserve the right, at their reasonable discretion, to vary, add to or delete the Promotion terms and/or terminate the Promotion. “Citibank” refers to Citibank Singapore Limited and “Plate” refers to Carlton City Hotel (Singapore) Pte. Ltd.